If you want to try it out without entering your email address, please use our public HR Innovation Canvas Demo for a first impression. The HR Innovation Canvas is a set of tools that seeks to create a common understanding of all employees for values, standards and behaviour based on an analysis of the company’s previous corporate culture. The previously developed solutions are communicated externally in an authentic way, for example through employee statements, as soon as increased satisfaction is achieved within the own organization. 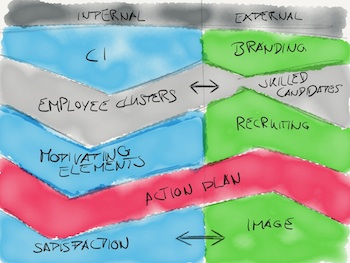 This development path is represented graphically in the canvas. The company’s management, HR, department directors and skilled employees will jointly establish a culture alongside a questionnaire which is individually matched to the company.